When building a custom swimming pool, a number of factors must be considered. Many times, homeowners become caught up in the idea of choosing a pool shape and fun accessories but forget about other important inclusions for their pool. Among the elements that must be selected to ensure a beautiful pool is a coping tile that will enhance the overall pool design. At Min Yoshida Pools, we want to ensure you have a swimming pool that will meet all of your expectations. Choosing a pool coping tile that will complement your pool design will ensure you have a pool you are proud to show off to friends and family. No swimming pool is complete or looks finished until it is edged with pool coping tiles. Along with providing a finished look to your pool, they also offer important safety elements. Coping around a swimming pool serves as a seal to the swimming pool structure while also protecting the pool wall from potential water damage. A variety of materials is suitable for swimming pool coping tiles, but the best materials are typically natural materials. There are also many different styles of pool coping from which to choose to suit the specific look you are hoping to achieve. 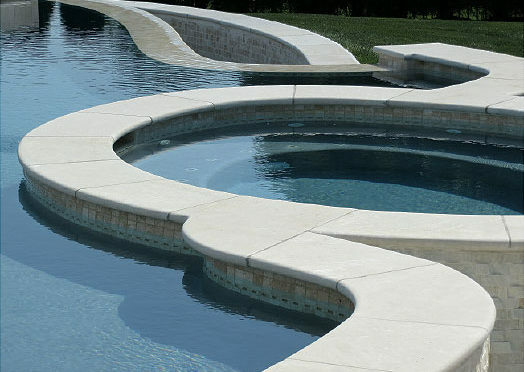 Among some of the most popular swimming pool coping tiles include limestone, sandstone, and slate. Regardless of the type of pool coping tiles selected, they should be nonslip to ensure swimmers are able to achieve a firm grip prior to entering the pool or when holding onto the sides of the pool. Various styles of edging are also available, including bullnose tiles and straight-edged tiles. The specific look selected for a swimming pool will vary based on a number of factors, including whether the homeowner wants a sleek and contemporary look or something more traditional. Previous PostTips for Choosing the Best Concrete Countertop for a Posh RestaurantNext PostWhat Is a Concrete Release Agent, and Why Is It Used?